It seems like the current buzz word in the design industry and everyone wants one. But how exactly can a product benefit from having a living, breathing design language? I’m going to try break down the very basics so you can understand why it’s needed. Creating an underlying language will unite our design philosophies and methodologies across our platform. So why do we need a design language? It creates a holistic perspective to ensure we’re all adhering to the same methodologies and patterns as a team. Every team member should be inline with the concept that we’re promoting and should be able to reference the design principles against any project they are currently working on. The main goal of a design language is to create focus and clarity for designers. A design language is like any language. If there is any confusion it will cause a breakdown in communication. Having a cohesive Design Language creates harmony within a platform. For onlookers, standardised colours, interactions and patterns creates a sense of familiarity and security. A well planned and well executed design language is the key to a gratifying experience. For instance, if you walk into a Starbucks in Iceland, you will recognize a lot of similar touches to your local Starbucks down the road. Familiarity brings a sense of comfort and security to the user. Introducing design constraints on individual elements within a platform creates consistency at a higher level. Confidence: allow the designer to have complete confidence in what they are designing and that it is in line with others in the team. Having solid design principles in place, that the whole team has contributed to, ensures that we’re all adhering to the same methodologies and patterns as a team. Every team member should be in line with the concept that we’re promoting and should be able to reference the design principles against any project they are currently working on. Creating the visual identity isn’t something that will be created overnight. It takes time. Sometimes it’s as clear as day as to what is needed, other times it takes time for the building blocks to fall into place. Once in place, it’s important that the fundamentals are captured and documented at a high level. The likes of use of colour, typography and style of iconography is key to creating consistency across a platform. You probably are fully aware of how important a design language is within your platform but saying to yourself ’where do I start?. This article is pretty high level. Creating a design language goes far, far deeper then what I have identified above. 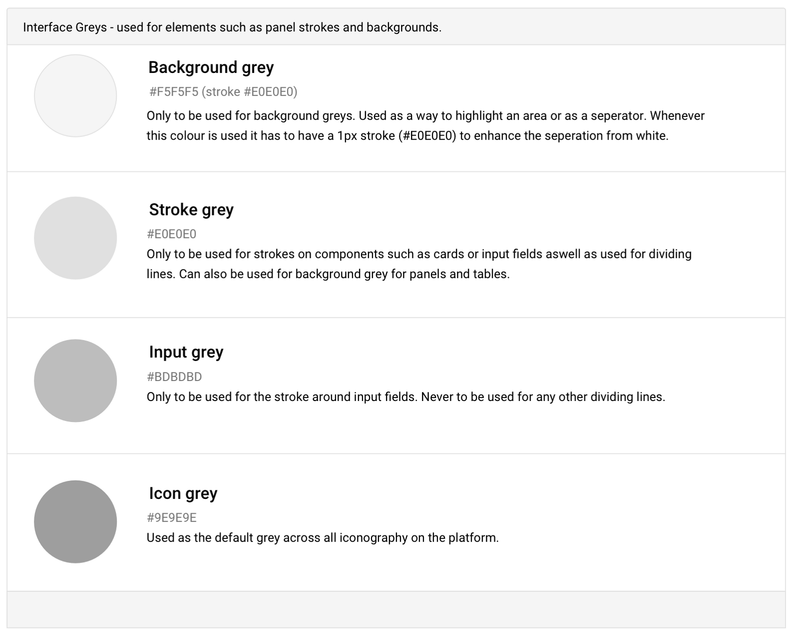 The creation of the style guide and in turn the development of a component library is the evolution of a design system. I’m sure every design team has different priorities with regards to what they feel is crucial to creating consistency but there are generally some elements that are critical to creating the basics. The likes of colors, typography and iconography is a great place to start. Work closely with the design and development team to create a list of priorities based on your UI audit, this should guide your road map for the foreseeable future. I’ve found using a Trello board, as a way to keep a priority list up to date, is a great way of working. It allows you to a) create your list and set items in a line of priority i.e. what are you going to tackle first and b) allows you to track exactly how far along you are with each component. So now that you’ve identified exactly what you’re going to be tackling first in the priority list, it’s time to sit down with the design team to get all ideas and opinions out around the first components needed. There are various approaches as to who owns the design system project, but for this example I’m going to take the instance that there is one sole designer who is in charge of the project. Its time to start making some decisions. Document what you are creating, ensuring that you’re catering for all instances needed. It’s vital that what you are creating is not subjective. You have to have rationale as to why you are making these decisions as it will allow you to explain your decisions to the design team down the line. An example of color usage. The next step is to try out your decisions. It’s very easy to make decisions on paper but when you are putting them into practice it might turn out that some decisions just don’t work. Try out some examples of the new style using current designs. Once you are happy with the outcome, and you have buy-in from all parties, it’s time to lock it down and educate the rest of the team as to how and why these elements are to be used. It’s important to remember that although you are locking down the styling, if you feel certain elements aren’t working, you can change them if needs be. Once you have educated the team and are comfortable in the knowledge that the designers are respecting your decisions, it’s time to move on to the next set of elements. It’s up to you as to how many elements you take at a time, but you should never bite off too much. It will just distract you from really focusing on the smaller details. My starting preference would be : colors, typography, icons, input fields, tables, lists. Once everyone is educated as to what the new style is, it’s important that all designers and developers are implementing the styles properly. Weekly check-ins are vital to monitor the style choices to ensure that everyone is working off the same design decisions. Using products such as Craft by Invision really help bring consistency when moving forward. The design language is not a success until the company starts using it and finding value in it.